Jan Doty made this recipe for us this winter and Dave and I have made it several times since! The fresh tarragon provides a bright flavor. Adding the seafood at the very end allows for preparing most of the stew before guests arrive. Thank you again Jan for another outstanding recipe! 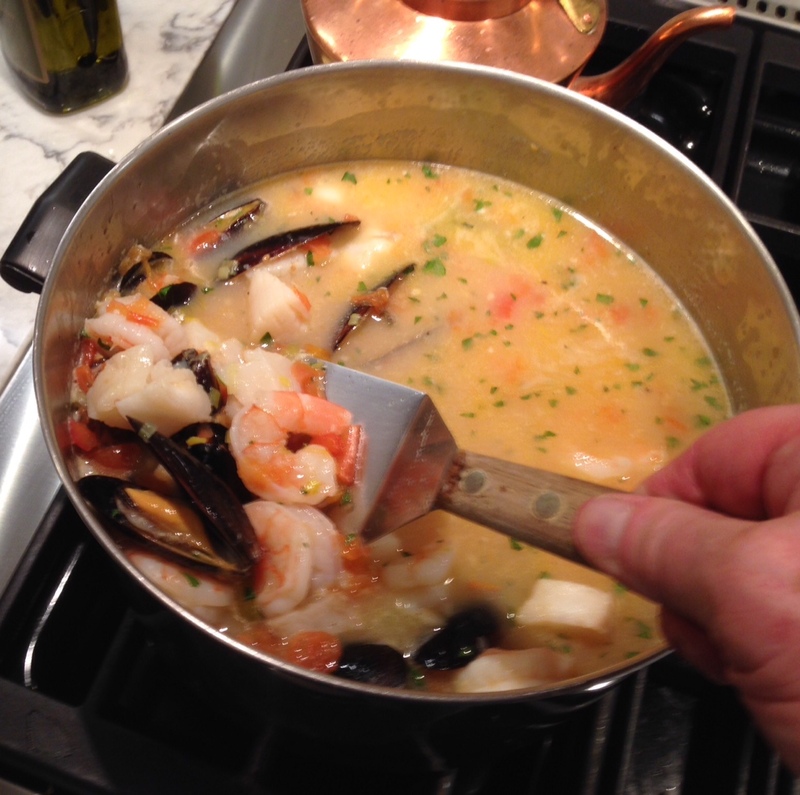 Poaching is an excellent way to cook seafood, since the cooking liquid makes a flavorful base for sauce. This recipe features a French technique called monter au beurre (to mount with butter), whereby chilled butter is whisked into the cooking liquid at the last minute to ensure a satiny sauce. We often double the recipe when entertaining which serves at least 10. A single recipe is written here. Heat oil in a large Dutch oven. Add leek and garlic and cook 4 minutes or until tender, stirring occasionally. Add tomatoes, wine and broth and bring to a simmer at least 10 minutes. Keep at a low simmer covered until ready to serve. When you are ready to serve, whisk the butter in. Add the tarragon, lemon rind, salt, pepper and cayenne and bring broth to a boil. Add the seafood and all it’s liquid. Bring it up to a full boil. Serve immediately with white rice or brown rice and crusty bread or naan/Arabic bread. Posted in main dishes, Soups and Stews and tagged monter au beurre, quick dinner, seafood, soup. Bookmark the permalink.